In a new CFO survey, finance chiefs talk about the challenges they face in finding equilibrium between their jobs and their personal lives. How hard is it to have a life these days? For CFOs, very hard. Only 12% of finance chiefs manage to strike a 50–50 balance between their work and their personal lives. For the rest, work commands most of their time, energy, and attention. Eighty-five percent of finance chiefs say work takes up at least 60% of their waking hours, while 6 out of 10 CFOs devote 70% or more of their time and energy to their jobs. These are some of the highlights (or lowlights, depending on your point of view) of a new survey on work-life balance by CFO. More than 400 senior finance executives responded to the survey, answering questions and offering advice on finding equilibrium between work and life — even though that balance is weighted toward work for most. They made it clear that CFOs work hard, often shortchanging their personal lives and sometimes pushing themselves to the point of burnout. The executives also stressed that work-life balance is a personal measure; what’s acceptable for one may be unacceptable for another. Most (67%) said that if they were given a second chance, they would choose a finance career all over again. More findings from the survey are discussed below, ranging from hours worked (a lot) to vacation days taken (not enough). Despite the fractional increase in average total hours worked, nearly three out of four respondents (73%) said their total number of hours devoted to work has increased, thanks to mobile technology and greater connectivity to enterprise systems. Certainly, the pressure on finance chiefs to be available around the clock is considerable. Three out of four respondents (76%) agreed that responding to business e-mails or messages outside of normal business hours reflects the strong pressure they feel to be reachable at all times. Nearly 9 in 10 respondents (89%) reported that the expectation that they will respond to e-mails and messages outside of normal business hours has increased compared with five years ago, including a majority (53%) who said that this expectation has “increased a lot.” Not surprisingly, this 24/7 accessibility has degraded the quality of life at home. 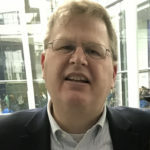 Nearly two-thirds (62%) of respondents disagreed with the notion that, over the last two years, advances in mobile technology and better connectivity to enterprise systems has led to an improved quality of life outside of work. On the other hand, 61% of respondents did agree that better mobile technology and connectivity have improved their ability to honor personal commitments and attend personal events (if not necessarily improving their ability to focus on the event at hand). A majority (54%) of respondents said that they still do at least 90% of their work in their primary office. However, the trend toward doing more work away from work is growing. Sixty percent of respondents reported that they now work away from their primary office more often today than they did five years ago, and 63% expected that they would work away from the office more often in five years. Although the intensity of pressure felt by CFOs at work has actually declined over the last decade, it remains omnipresent. More than half (56%) of senior finance executives indicated that they feel “high pressure” or “very high” pressure at work; this number fell from the almost two-thirds (62%) who felt such pressure in 2004. (See Figure 2, above.) 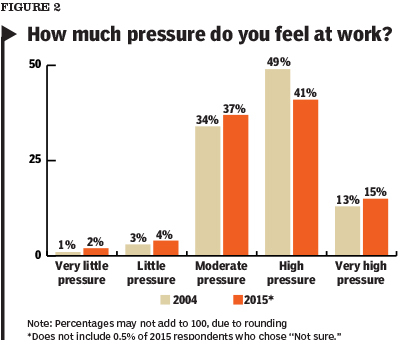 Similarly, more than half (59%) of respondents said that pressure has increased over the past two years, down from the more than two-thirds (68%) who said so in 2004. A slightly higher percentage (61%) of female respondents reported that they feel “high pressure” or “very high” pressure” at work, and more than two-thirds (68%) of female respondents said that pressure has increased over the past two years. 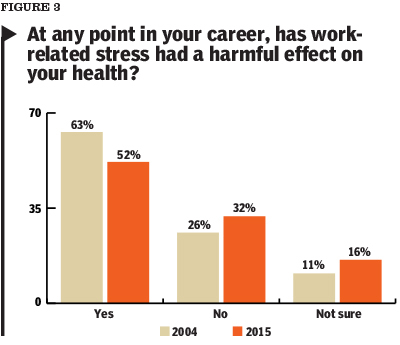 Half (52%) of respondents said that work-related stress has had a harmful effect on their health at some point in their careers, compared with almost two-thirds (63%) who said so in 2004. (See Figure 3.) Six in 10 (62%) female respondents said that work-related stress has had a harmful effect on their health at some point in their career. A large number of survey respondents noted that maintaining a healthy body is the most important way to avoid burnout, specifically because diet and exercise are variables that can be controlled. Respondents recommended dozens of activities — yoga, sports, meditation — generally with the caveat that any activity must be an immovable part of the CFO’s daily schedule. And while their messages about diet, exercise, and sleep tend to mimic doctors’ oft-ignored recommendations, respondents did convey thoughtful advice on avoiding burnout. 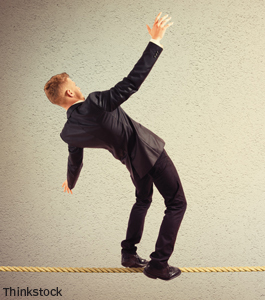 More than half (58%) of survey respondents said they place a high priority on managing their work-life balance. And more than three-quarters (78%) said they expect to place a higher priority on work-life balance when evaluating their next significant career-related decision, compared with their last one. 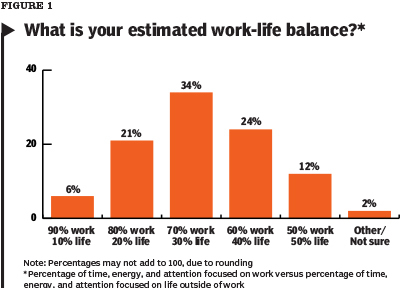 Together, these data points imply that placing a high priority on work-life balance does not mean that an acceptable balance is actually being achieved. As for vacations, a little more than one-quarter (27%) of respondents said they use all of their vacation time, down from more than one-third (38%) in 2004. However, half (50%) of respondents said they believe it will become less difficult to use their available vacation time over the next five years. 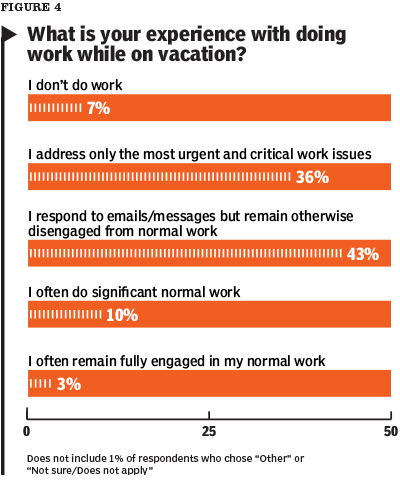 Only 7% of respondents reported that they don’t do work on vacation, a percentage that fell to 2% for CFOs at organizations with annual revenues over $1 billion. The majority of respondents chose a middle ground (see Figure 4, above). As for the future, a third (33%) of survey respondents thought their work-life balance would improve over the next five years, while half (50%) said it would stay the same.